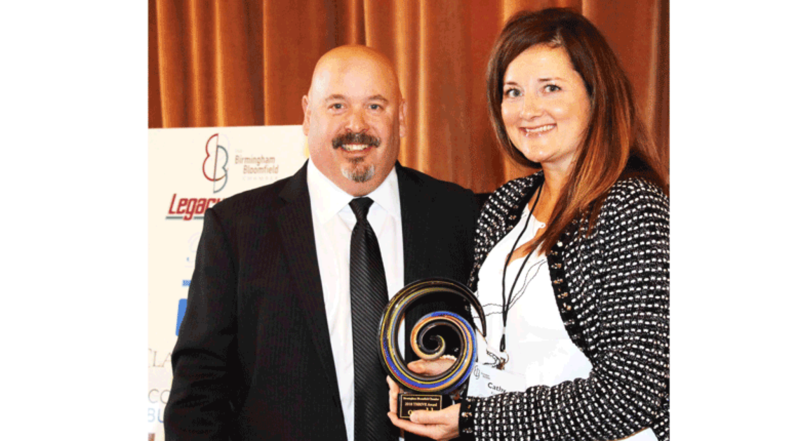 BIRMINGHAM, MI – Dec. 7, 2018 – Oswald Companies, one of the nation’s largest independent insurance and risk management brokerage firms, was recognized with the 2018 Thrive Award by the Birmingham Bloomfield Chamber during their annual meeting on Dec. 5. The Thrive Award represents the Chamber’s new strategic plan based on the belief that companies practicing “conscious capitalism” and “profit with purpose” are among the most successful. Oswald Companies, located in Bloomfield Hills and employee-owned through its Employee Stock Ownership Plan (ESOP), was selected because of their corporate culture built around caring for the community as well as their employees. In addition to offering a work environment where spontaneous ping-pong tournaments are encouraged and flexible office hours give employees time to deal with children, aging parents and pet issues, Oswald promotes regular volunteer service. Every month the company sends a team to help feed the homeless at Detroit’s Pope Francis Center. Oswald also participates in quarterly days of caring and offers an additional personal day to those who want to support a charitable passion of their own choosing. Cleveland-based for 125 years, Oswald Companies has six Ohio locations in addition to their Bloomfield Hills branch. In Michigan since 2006, the office provides commercial Property & Casualty Insurance, Private Client Management, Life insurance, and Employee Group Benefits.